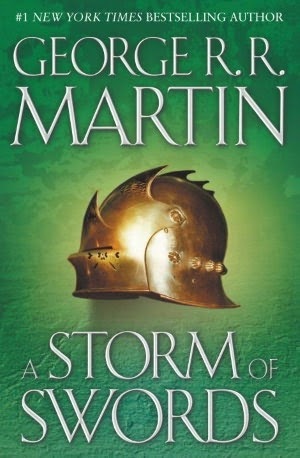 Review: **This review contains spoilers** After Stannis is defeated at Kings Landing, he retreats to Dragonstone to rebuild his troops and plan his next course of action. He is still being counseled by the Red Woman (Melisandre) but his Hand, the Onion Knight does not trust her. Meanwhile, Robb Stark, remains undefeated in battle but breaks a vow which leads to tragic results. Catelyn Stark releases the Kingslayer (with the intent of trading him for her daughters) without the consent of her brother (who was holding him hostage) or Robb, which leads to dissent at Riverrun. Jon Snow is still playing turncoat with the King Beyond the Wall (Mance) and his true loyalties are tested. Sansa is still being held hostage at King's Landing, while Tyrion finds himself cast aside for his father and not given any due for saving the city during the battle against Stannis. Meanwhile, Arya is still trying to find her way back to her mother, while across the sea Dani continues to conquer cities and groom her dragons. This was an action packed adventure and I could not stop reading. Without question-this is the best book in the series so far. Excellent character development, several plot twists, several deaths (some anticipated, a few I did not see coming at all). A literary game of Risk-and I loved every battle.